Panzerbefehlswagen (Command Tank) III Ausf H(U) Tauchfahrig (Submersible Motor Vehicle) also known as Tauchpanzer or U-Panzer (Submersible Diving Tank, Underwater Tank). 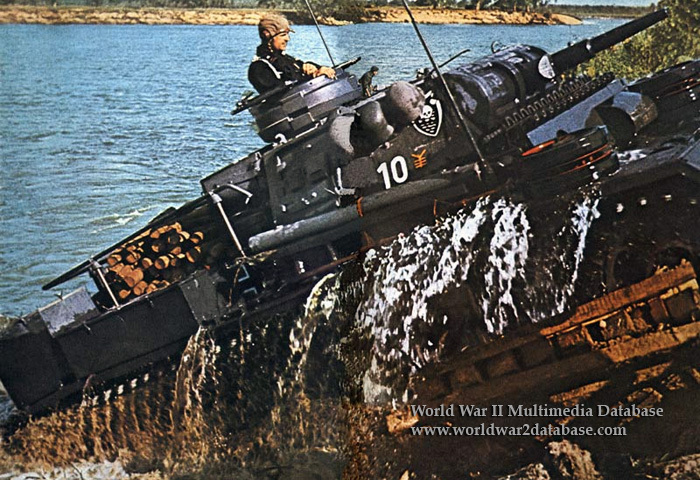 During the preparation for invasion of England, Operation Seelöwe (Sealion), Panzer IIIs and IVs were converted into submersible tanks. All openings were sealed, commander's cupola, gun mantlet and machine gun mount covered with rubber sheeting, turret ring protected by inflatable rubber ring. Exhausts were fitted with valves that let the exhaust leave but kept water out. Air was supplied via a flexible 60-foot (18-meter) hose held on the surface by a buoy. Maximum safe depth was about 50 feet (15 meters), maximum underwater speed about 3 miles per hour (4.8 kilometers per hour). From June to October of 1940, 160 Panzer III Ausf F/G/H and 8 Panzerbefehlswagen III Ausf E along with 42 Panzer IV Ausf Ds were converted into Tauchpanzers. Since Operation Sealion was cancelled, Tauchpanzer IIIs and IVs were used during Operation Barbarossa, in service with 6th Panzer Regiment, 3rd Panzer Division, and 18th Panzer Regiment, 18th Panzer Division (which crossed river Bug at Patulin). These vehicles used a rigid air supply hose and could ford water up to 13 feet (4 meters). This photo is probably staged, taken before the invasion of Russia.